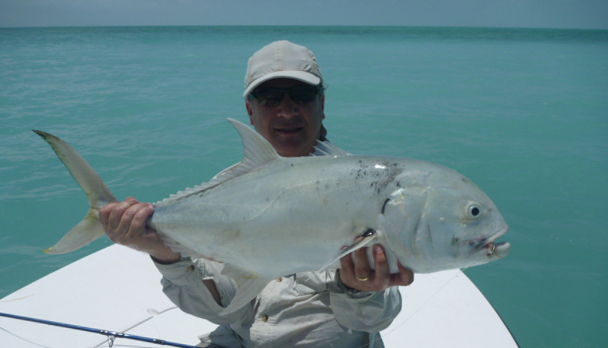 Cayo Largo is one of the best and most varied fisheries in the Caribbean Sea. It is a Natural Park of 27.000 km2, in the Canarreos Archipelago with about 350 islets and cays forming a marvelous oasis. 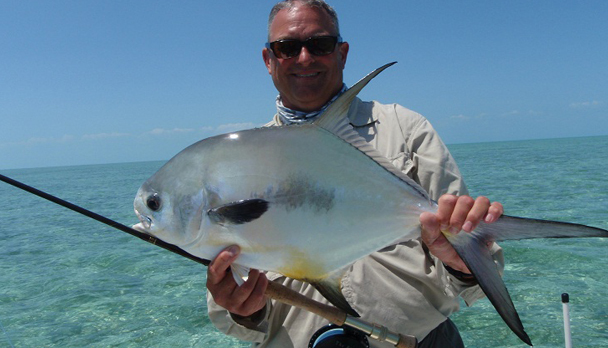 Is the ideal environment for fly fishing enthusiasts, home to diverse species such us bonefish, permit, tarpon, jack crevalle and mouton snapper. Cayo Largo del Sur, also known simply as Cayo Largo, is a small resort island belonging to Cuba, in the Caribbean Sea. It is the second-biggest island in Cuba's Canarreos Archipelago. Cayo Largo is a limestone island, formed over millions of years from the remains of marine organisms, such as the ones that build coral reefs. Living coral reefs form one more attraction for tourists on this island, although coral bleaching has stressed some reef communities in the Caribbean. The northern coast of Cayo Largo consists largely of mangroves and salt pans. While the water south of the island appears clear enough to reveal the underlying ocean floor, the water on the north side of the island is cloudy. This cloudy water indicates that sediment is washing off the land surface and into the water or is being stirred up from the shallow sea floor. 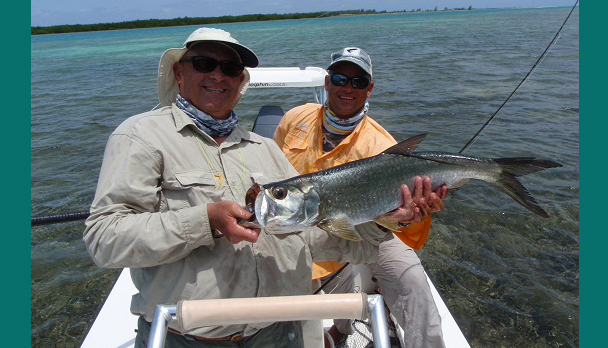 The northern side of Cayo Largo, where the submarine shelf is extended, is the ideal environment for fly fishing enthusiasts: Bonefish, Permit, Tarpon, Jack Crevalle and you will be able to see Permits zipping and darting in and around schools of Bonefish. 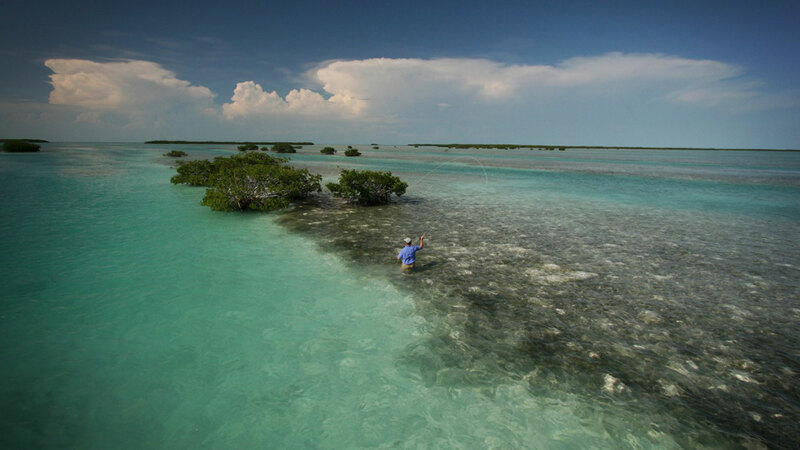 The fishing area of Cayo Largo is a Natural Park of 27.000 square km and an average depth of 59 inches. Canarreos Archipelago has about 350 islets and cayos and forms marvelous oasis in the Caribbean . The south side of Cayo Largo is protected by the coral barrier and its white beach of fine sands and the flats marks it out as a fantastic place for waders. The wide fishing area is subdivided in 38 micro-areas. 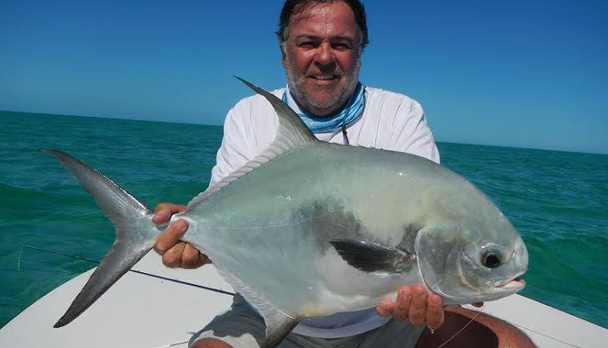 The majority of Cayo Largo Flats have firm bottom and provide a good wading, most days you will have the option of either fishing from the skiff or wading. 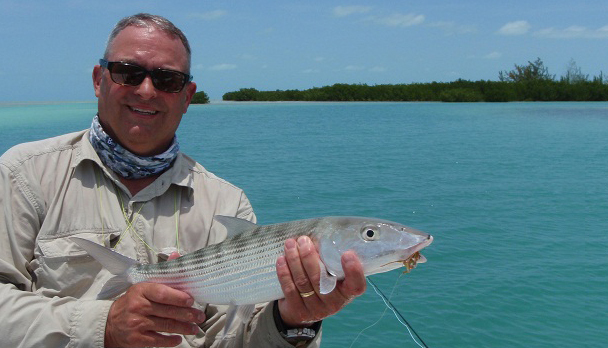 Anglers choose to take advantage of the best time to spot bonefish and permit on the flats, usually from 7:30 a.m. to 4:00 p.m. earlier and later. The package includes reception at Havana airport; airticket Havana/Cayo Largo roundtrip; 6-full fishing days; 7-night accommodation in "Melia Sol Cayo Largo" all-inclusive Resort, or Villa Marinera, or Jardines Avalon I yacht. 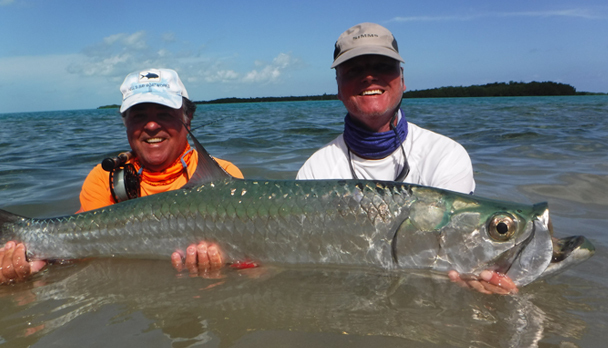 November/January: The beginning of the season from November to January is very good with plenty of bonefish (especially big ones) on the flats and mangrove areas. Fishing for tarpon and other species can also be excellent. It is a very pleasant period to plan a trip to Cayo Largo as the weather is much warmer in Cuba than in Europe or Northern America. February/June: Peak Season is from February to June when all species are present in the area such as tarpon, permit and jack. 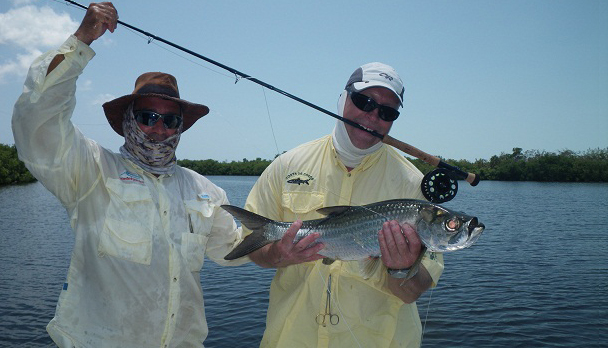 Migratory tarpon, up to 80/100lbs (average 15/30lbs) are regularly spotted and casts to Permit are very frequent. This period is the best to try the Gland Slam. Many Grand Slams are made each season and also some Super Grand Slams (Tarpon, Bonefish, Permit and Snook). July/August: In the late season the weather gets hot but the fishing is still very productive, especially for tarpon and permit. 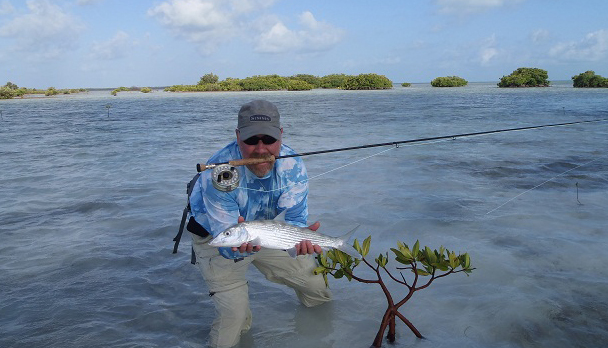 Fishing for bonefish is also very good in the morning and in the evening. The statistics are very interesting. They show that the same number of fish are caught during the hot months, however, by half the number of rods. Sol Melia Cayo Largo: The all-inclusive Resort is located on Cayo Largo del Sur. It is 177 km from Havana City and is 27 km of cool fine-grain white sandy beaches. The Resort provides a broad array of services and attractions: a Club House for daytime activities, three restaurants, spanish classes, cocktail and cooking classes, party hall, karaoke night club, diving school nearby, health Center with gym, sauna, jacuzzi and steam bath, two tennis courts with artificial lighting, multi-purpose courts, bikes, ecological excursions, dancing classes, water sports center for non-motorized water sports, Cuban Club for cultural activities, and theater. 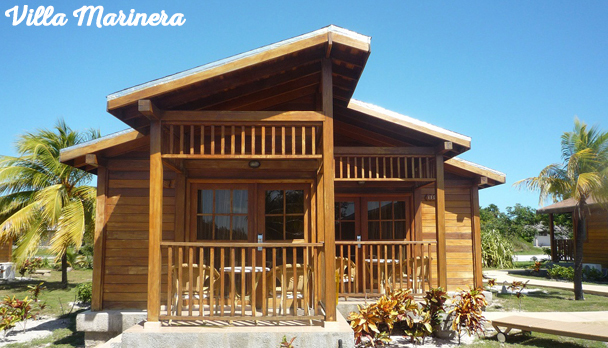 Villa Marinera: The villa is located next to the marina, head quarters of the AVALON fishing operation in Cayo Largo. It is a medium size complex with 10 lodge cabins, each of them equipped with 2 beds, private bathroom and air conditioning, balcony, TV and fridge. There's a meeting place with swimming pool, lecture room and pool table with air conditioning, a bar and restaurant. All cabins have view sea view, and access to a small mangle / sand beach. Is a brand new spacious live-on-board yacht of 110 feet long. It can accommodate up to 20 guests comfortable in double room cabins (some queen size bedded and some with 2 single beds), with private bathroom with toilet, individual climate controls and a safe. It has a capacity for 12 anglers, in 6 skiffs. The yacht has many comfortable sectors to move around; a sun deck with cushioned chairs, a jacuzzi and a shaded sector for those just wanting to nap. It also has an air conditioned lounge equipped with a large TV screen, comfortable sofa and plenty of fishing books to peak around. Snorkeling equipment is also available for those staying on board and can also venture out on an exotic island shore excursion. The cuisine on board offers a selection of American feasts, BBQ and local cuisine, with table side service featuring salads, vegetables, seafood, beef or chicken. Complete saltwater fly fishing tackle: #8 Wt; #10 Wt and #12 Wt. It is advisable to take at least two tackles for line #8 and #10; 1 (one) spare line WF 8 F and WF10 S. Sinking and Intermediate line for tarpon is highly recommended. 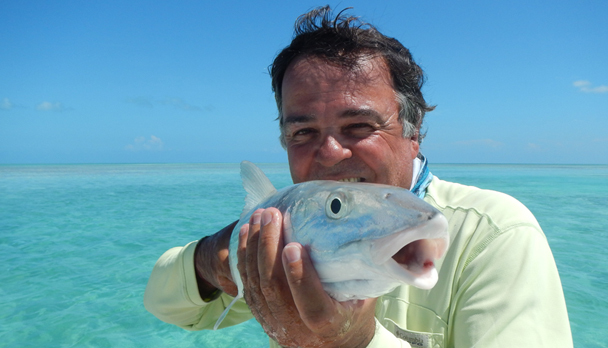 Flies for Bonefish: Crazy Charly; Gotcha; Bonefish Special; any kind of Shrimp; Clowser Minow. Flies for Permit: Avalon�s Special Shrimp; Merkin�s Crab; Rag Head Crab; Nick�s Casablanca; Mc Crab; Perminator; etc. Flies for Tarpon: Cockroach; Stu Apte; Seaducers; Sea Streamers; Tarpon Bunnies; etc. Others: Leaders for Bonefish 9 feet and 13,2 lbs. shock tippet; leaders for Tarpon 50 or 60 lbs. and 80 or 100 lb. fluorocarbon shock tippet. Spools with 12, 20, 40 y 60-pound fluorocarbon tippets. Silicone to clean the lines. A pair of pliers to remove hooks and pincers to cut steel. Steel line stretch for Barracuda and Shark. Hook sharpener. A wide-brimmed hat, with neck protection. Polarized glasses. Neoprene boots with rubber soles for sea-wading. A light water-proof jacket. Sun block, SPF 40 or higher. Medicine for headaches, stomach aches, anti acids, etc. Insect repellent. Rates include: Reception in Havana airport. Domestic flight to Cayo Largo and return. 7-night accommodation in Jardines Avalon I yacht. All meals and beverages with limit. 6 full fishing days. Marine Park license. Notes: Ask rate for non angler companion. Rates include: Reception in Havana airport; 2 nights in Havana in a 5*Hotel; domestic flights and transfers; 7-night accommodation in Villa Marinera; all meals and beverages with limit; 6 full fishing days; Marine Park license. Rates do not include: Airport taxes; Cuban visa; personal insurance; transfer IN/OUT La Habana hotel/int'l airport; fishing equipment and flies; personal expenses in Havana; gratuities. Rates include: Reception in Havana airport; domestic flights and transfers; 7-night accommodation in Hotel all inclusive; 6 full fishing days. Marine Park license. Rates do not include: Airport taxes; Cuban visa; personal insurance; transfer IN/OUT La Habana hotel/int'l airport; fishing equipment and flies; gratuities. Notes: Ask for rate for noon angler companion. July was a month with stable weather and moderate winds. Sunny days with some partly cloudy ones. The water temperature kept around 80,6 F while the air temperature kept in the 92�s F. The season is good so far, with a high number of fish. During one week beginning of July, the captures were the following: 75 bonefish, 3 tarpon out of 5, 1 permit, 13 snapper, 22 jack and 4 cudas. One Grand Slam was achieved during that week! My trip to Cayo Largo went very well. The weather of course was hot and very humid and we only got chased off the water once for a few hours because of an afternoon storm. The water on the flats became too warm at times and so the permit vacated for cooler water, we only had a few reasonable shots at the permit and missed them for one reason or another, There were plenty of bonefish and we had some good fun with the tarpon. All of our transportation and accommodation went well without any problems. I would like to fish again next year but probably in spring so please keep me on your mailing list and let me know if any special offer becomes available. Thank you for all your help and for organizing an excellent fishing trip. Our week in Cayo Largo was very good and we had a great time. The weather quiet good concerning wind and sun. We were able to see many tarpon, even more than other years and of good sizes. We hooked up a couple of 30, 40 and 60 lbs, lots of fun! The water was quite warm due to the high temperatures, therefore bonefish moved from the flats to lower places forming muddy spots. Pemit following bonefish in this big muddy spots which made it difficult for us to cast only at them since generally bonefish eat quicker than permit. 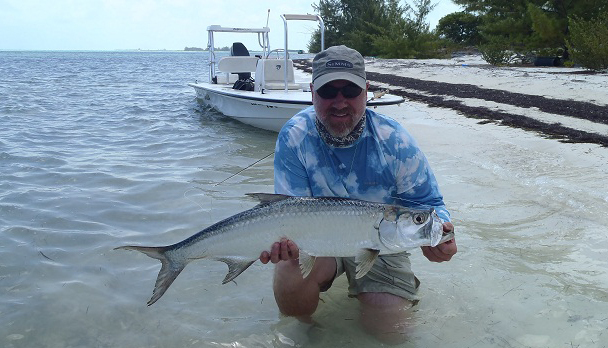 We hooked up many bonefish ranging the 8lbs weight! The other big success was staying at Villa Marinera, out of this world!!! The new modern cabins are really comfortable and you even avoid the transfer everyday to the hotel, etc? an excellent choice! My week in Cayo Largo has been very productive. We arrived to Cayo on the 25th, and we were told that the last 5 days a cold front entered the area, bringing cold weather and rain, as well as low pressures. 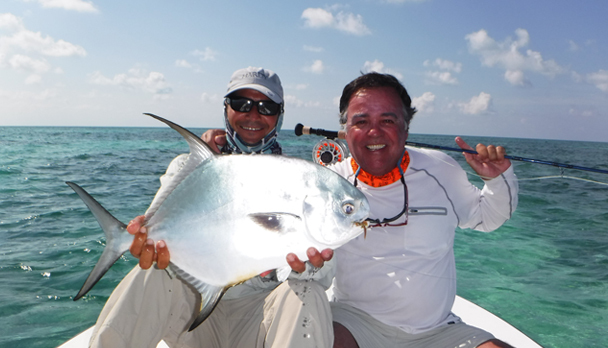 Therefore during our first fishing day we saw very few fish, only one permit during the morning and 2 tarpon that afternoon. During our second day, we found a school of permit in one of the channels and after 30 minutes of persecution I finally was able to cast at them and the biggest of the group grabbed the fly, unfortunately after trying to set the hook I lost it. During the third day I landed 3 permit!!! Two of them were following a ray and the other one was a loner... we also fished quite a lot of bonefish and I hooked a tarpon around 50 lbs but lost it. During the fourth day we saw during the morning 3 permit but the casting was very difficult and couldn't throw at them. After lunch, we approached a muddy spot in a flat and saw 2 permit cruising around, after my second cast the fish couldn't resist my fly! I also hooked a very bod snook but after a while of fighting the line cut off... apparently it was already burnout. Overall I can't complain, I landed 4 permit in a week in October, which is not usually the best fishing period. As always our guide William was spectacular and Mauro's attention extraordinary. I also must say that the Hotel has improved quite a lot since Fernando's new managing. 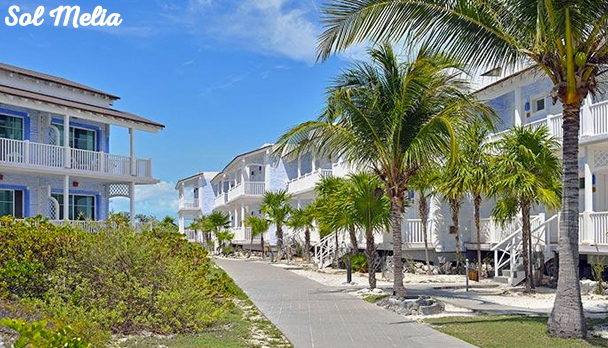 The week August 3 to 8 in cayo Largo was fantastic! As you already know, we were 3 skiffs fishing 4 anglers friends of mine, my close friend Marcel and me. During the week we alternated the fishing companion and skiffs, so we could all fish together. The weather was great during the whole week, except for the first afternoon that there was a shower storm. Mauro, the head manager of the Marina, told us that his fly 'Avalon Fly' has been working to perfection and that so far 497 permit were caught on it, and he wanted us to get to the number 500 with us! So I said we were going to go for it! The second day my friend Doug (great fisherman) hooked a permit, very nice one but as he fished it with a "Made in the US" fly, didn't count for the #500. 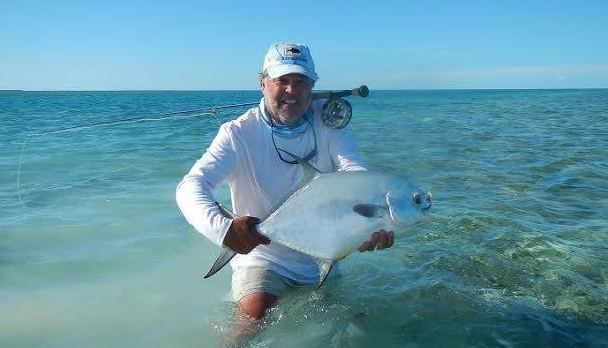 The third day my friend Doug and I fished together and something unusual happened to us; at 10am I hooked a permit that was swimming on top of a ray, but 5 minutes later it spitted the fly without any reason, which made me go crazy, I almost wanted to break my rod! 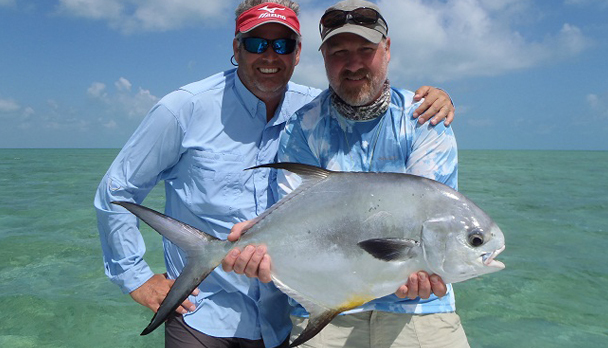 At 11am Doug hooked another permit and after 12 minutes it did the same thing. 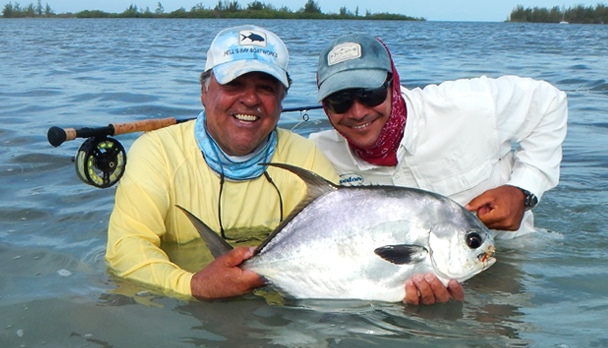 With William, our guide, we were amazed and angry, when I suddenly see another permit, cast at it and finally took my Avalon fly and 10 minutes later is was ours! After landing the number 478 we only had 2 more to go!!! The fourth day I fished with Joe, also a great fisherman, and around 12pm I got to hook the most satisfactory permit I've ever fished, due to its strength, the complexity of the cast and wind, etc... it didn't doubt in taking the Avalon fly and after a couple of minutes the approximately 16 lbs permit was landed. It was the # 479!!! The last day, I fished with my friend Marcel, only until 3pm since later that afternoon we had to take the flight back to La Havana. At 9.45am, very close to the Marina we saw a small trail in the water, and due to the very low visibility I threw my line 1 meter in front of the trail, and suddenly felt a resistance so I hooked and there it was, the #500 pemit!!! In total during the week we had two Grand Slams. 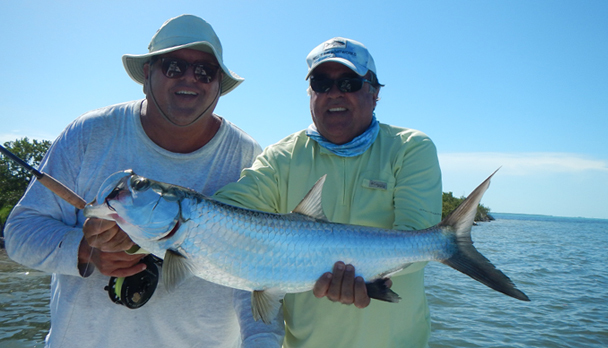 For the rest of the fishing in general, we landed big bonefish and some tarpon, but fewer than last summer. Thank you Daniel por organizing everything, my gratefulness to Mauro as well who treated us excellent as always and also thanks to all my friends who made that week and amazing trip! Thanks for your help in arranging one of the best fly fishing trips we have ever had! Mauro and his staff at are very organized and it's fantastic the advantage they take of the fishing opportunities. Our party of 8 fishermen ended up with 1 super grand slam, 3 grand slams, and another near grand slam as 2 tarpon were lost in the last minutes of the day. I am confident we will return in the future. Food and other amenities as well as a day in Havana were great. Our days in Cayo Largo were great. The fishing was good, even though I suffered a bit since my experience with heavier rods was very poor. My guide was Vila and made me fish tarpon, snapper, jack crevalle, shark, cuda and some smaller fish. My wife had a good time as well and the weather very hot, but great. I didn't get to fish permit, since the jack of the attached picture took the fly before the permit! Next time. So my fishing week was very good in general. Thanks for all the organization! In Cayo Largo the fishing was excellent in every way. The fishing was excellent in every way. The quantity, variety and quality of the fish were everything a fisherman could dream of. By the first morning, two anglers from the group had achieved a Grand Slam, making the guide even prouder than the angler himself. On the following days, the number of Grand Slams continued to rise reaching six. We kept precise record of the catches we landed, but what prevailed above all was the overwhelming sense of having experienced the best fishing ever. We cant wait to go back!!! Cayo Largo, Cuba. The fishing was great ! After returning to my homeland in Chile and sharing a trip with an amazing group of 8 anglers from different parts of the world, I hold lovely memories of my trip to Cayo Largo, Cuba. I must admit that I had thought it would be quite similar to other places in the Caribbean Sea. However, I found something entirely different, starting from the professional organization that took every single detail into account, to the distribution of the guides according to each angler's personality, comfortable boats, and customized service, among others. With regard to the logistics of the operation, everything turned out perfect: reservations, schedule, useful advice, donation of items we had forgotten or were not available there, etc. The fishing was great too. My boat was one of the 6 boats at the time, and we achieved 3 Grand Slam out of the 6 ones of the week. Personally I truly believe that this excellent result was due to the perfect team work. Both the guide and my fishing partner showed great commitment to reach our goals. 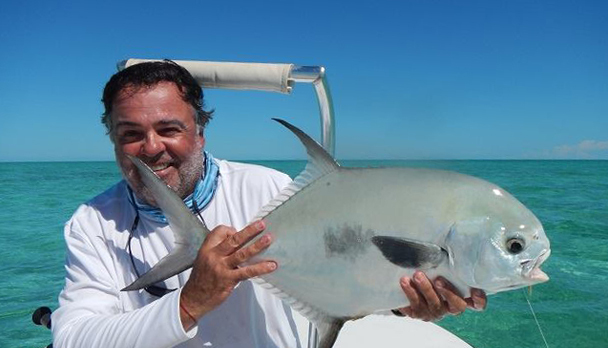 I�d like to thank FlyFishingCaribe, my guide Rigoberto, and specially my fishing partner Daniel Beilinson for offering me the chance of achieving 2 Grand Slam. 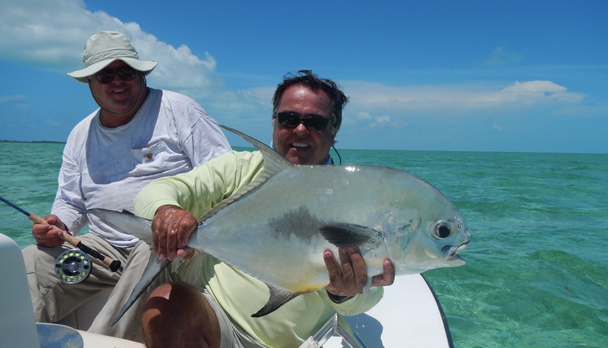 Cayo Largo offers great fishing !!!!! The day we arrived at Cayo Largo the weather was cool with cloud and a gusty breeze, not ideal for sight fishing on the flats. Roger still managed to land a few bonefish and I caught a nice mutton snapper. The temperatures began to rise the next day until the weather was warm and settled for our last 2 days on the islet. With increasing temperatures more fish came on to the flat and the fishing improved dramatically. On occasion we were casting to schools of at least 80 bonefish and pods of 30 tarpon. 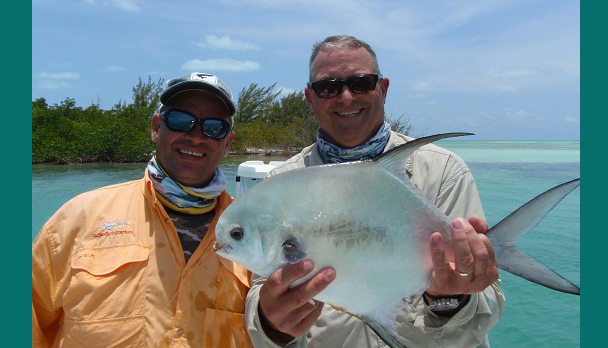 We both caught lots of good bonefish, some tarpon and we had shots at permit but didn�t catch this most elusive quarry. Beyond the grand slam species, Cayo Largo offers great fishing for other sportfish including jack crevalle, snapper and barracuda. The fishing operation is first class: Mauro from Avalon does everything he can to ensure guests have a wonderful experience and the guides are excellent and friendly. We booked our trip with Daniel from Fly Fishing Caribe. 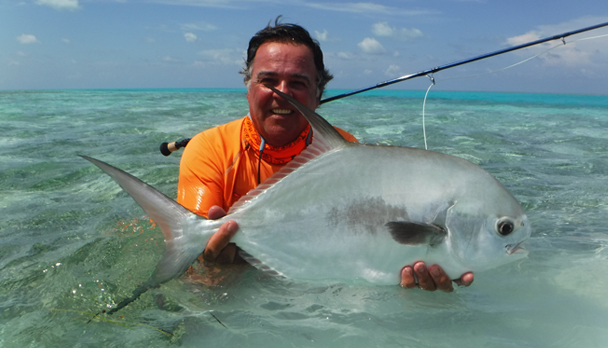 Daniel is fortunate to be very experienced in fishing around the Caribbean and offers sound advice on when and where to fish throughout the calendar. Daniel is also a frequent visitor to Havana and his guidance ensured we had a night to remember in this beautiful and lively city. Cayo Largo (Cuba). The fishing was great !!!!! Daniel, the fishing was great. 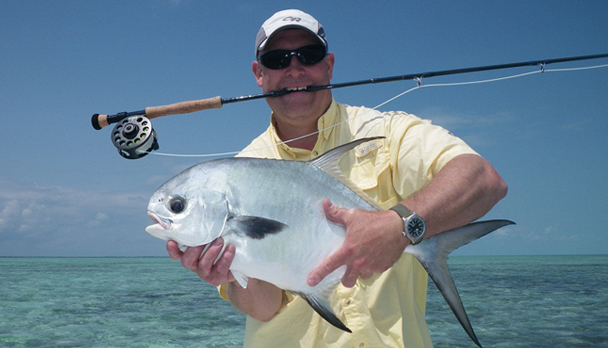 The key is full of permit, tarpon and even bonefish. I did get two Grand Slam and failed to achieve a double Grand Slam because the snook unhooked itself. There were big-size permit ( the ones I landed weighed 16 and 14 pounds), but I lost a 30-pounder, according to the appreciation of the guide. I hooked up about 30 tarpon and succeeded in landing 13, weighing between 15 and 75 pounds. 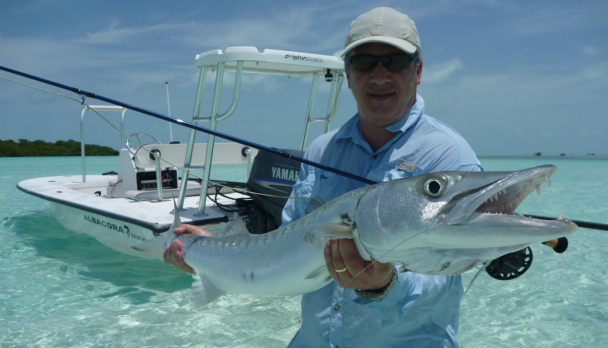 In my opinion, Cayo Largo is the best saltwater fishing destination by far. Besides, the hotel has all the facilities to fulfill the needs of a family.